← Error 39: The supplied currency code is either invalid, not supported, not allowed for this merchant or doesn’t have an exchange rate. Setting your show’s on and off times can easily be changed by going to Show | Edit a show | (double click on the performance). NOTE: Wintix uses a 24 hour clock, so remember to set the times correctly. Also known as Military Time, the hours 1 through 12 don’t repeat themselves as AM or PM. One o’clock PM is 13oo, 2 PM is 1400, 3 PM is 1500, etc. NOTE: Keep in mind that the off sale time affects Webtix, as well. So if you want different settings for the off sale time for online sales, you will need to go into the internet options for that show. 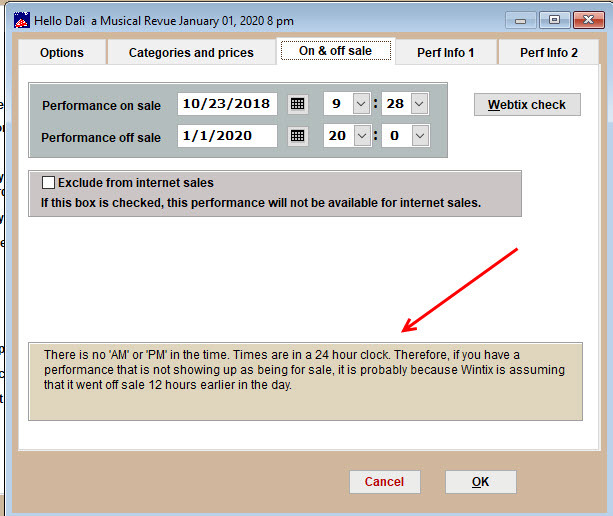 See how to adjust your times while adding a show. This entry was posted in Wintix 6, Wintix5 and tagged tutorial. Bookmark the permalink.